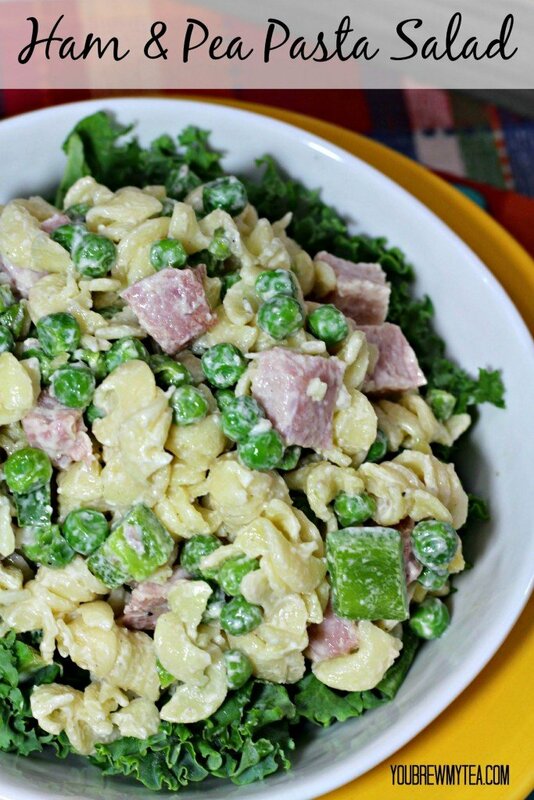 For the last five years, my Beau has been making this Healthy Creamy Pasta Salad with Ham & Peas for any potluck event we have at church or with family. 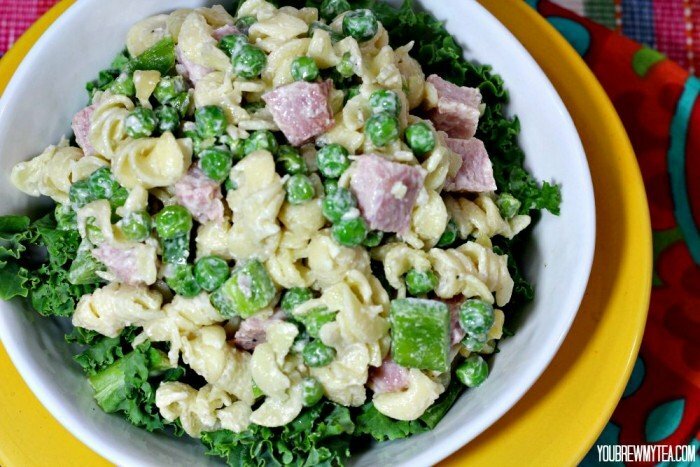 It is similar to one of the copycat recipes for Ruby Tuesday’s pasta salad you find on their salad bar, but also a bit different. It is a favorite for our family, and yes, it has been made over to be a healthier option! In fact, it is only 6 SmartPoints on Weight Watchers per serving! By cutting out the traditional mayonnaise and ranch salad dressing from this recipe, it is easy to create a healthier version with just as much kick if not more than the original that is so popular. It still isn’t exactly a low-calorie dish, but it is much healthier than the one we use to make and just as yummy. 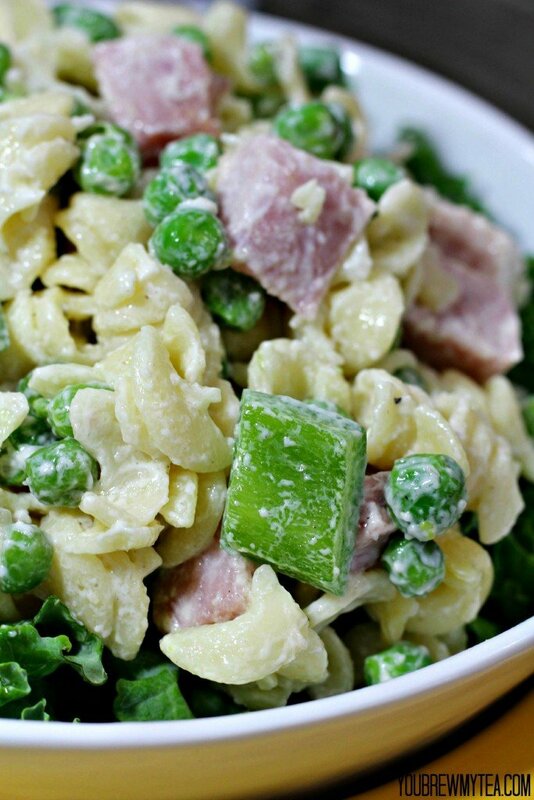 This Creamy Pasta Salad is definitely a favorite! We buy peppered ham for this since it gives a bit more flavor. Our friends who made this recipe for us, did not use peppered ham (see images), but I highly recommend you go with a peppered ham. If you are worried about the fat or salt in the ham, you may want to use cubed grilled chicken or turkey breasts instead. Both would compliment this well, and be seriously yummy. The mixture of buttermilk and this healthy ranch dip recipe that Jody shared with us a few months ago makes the perfect dressing for this recipe. It is healthy, delicious and seriously creamy like you expect in a pasta salad. You can’t go wrong using this when you want a healthy flavored dressing, dip or coating for nearly any vegetable or pasta dish. The recipe is included below in the instructions, but if you want just the dip, you can check the link above. Go for whole wheat pasta if it is available near you, or at the least choose some veggie enriched pasta. We love the Simply Balanced brands of whole wheat pasta at Target, or the Simply Truth Rice & Corn pasta at Kroger the best. This healthy creamy pasta salad is a great choice as a meal in itself, or as a side dish for some grilled chicken, pork chops or steaks. It’s definitely a bit more of an indulgence than other recipes, so account for the extra carbohydrates and fat content in your diet overall that day. Enjoy this dish year round as a special tasty treat that is full of yummy vegetables and protein. I calculate this creamy pasta salad recipe using the Recipe Builder inside my Weight Watchers program plan. You can also use the Weight Watchers SmartPoints Calculator if you aren’t on the Weight Watchers plan, but I highly recommend the monthly investment for great accountability! This looks delicious! What a hearty pasta salad. I think we should give it a try soon. I love pea pasta ~ and this looks so yummy!! I love that you used yogurt, too. This is such a great option! Love it! Thanks for linking up with What’s Cookin’ Wednesday!